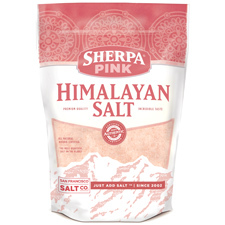 Sherpa Pink® Powder Grain Himalayan Salt is the perfect finishing salt. Use the Powder Grain Himalayan Salt the dust salt on popcorn, chips, nuts, and in soups, sauces, and smoothies! This salt is the perfect choice for those who crave saltiness without texture! Himalayan salt is a naturally harvested raw, unprocessed salt that is full of naturally occurring trace minerals.